After many hours of programming, many, many more hours fiddling around with the database, and a few seconds of changing some settings, I'm considering myself moved off of blogger. And sorry for breaking the feedburner feed. Unfortunately it might happen again a few times as I work out kinks in the RSS script. I'll be writing some other add-ons, like some administration, podcasting, and tagging tool tools, but for now I'll be happy if I can make all of this work and finish my move. I kind of miss my blogging habit. 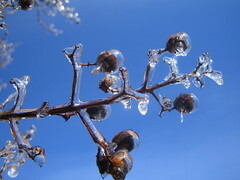 While not as amazing as some of the ice storms I saw while I was still living in Iowa, the two ice storms that have hit Northwest North Carolina in the last week have been beautiful in their own right. Because I haven't been blogging much between final exams, trying to get off blogger, and the fact I've horribly neglected my flickr account I've posted a set of photos I've taken after the two storms. One of the RIAA vs Consumer appeals came out with a decision against the consumer. In itself its not surprising, since the argument was a pretty poor excuse of canned defences. What's shocking is that she's been fined $750 per song. Which makes me wonder where the hell the judge got that figure. I can buy a the CD it came on for $20, I can get the track off iTunes for $.99, or I could subscribe to some download service and get it and a zillion more for something like $5 a month. None of those cases gets over $3 a track. I can understand a reasonable fine for illegal activity, a 750% increase. That's outrageous. Makes me glad I'm not supporting the RIAA. I may end up getting an Video iPod soon than I expected, my 20GB grayscale 4G iPod died sometime yesterday afternoon - massive hard drive failure. I've known since last night - between not booting, random error messages, and a very loud, clicking hard drive I knew early on it was the drive. Unfortunately its out of its 1 year warranty, and I know the drive is gone for sure since I was able to mount it long enough to run some disk utilities. Despite a full reset, an attempted repair, and a try at reformatting, its one very screwed hard drive. At this point I could start shopping for a new drive off ebay, but a new known working drive is easily $150, and I was already outgrowing the 20GB drive. A new 60GB would run me around $370, give me photos, video, and more space. I'm pissed, tired, and a couple other things, but in the end this just means I'm getting a 5g sooner than expected. I just wish I had moved some of the files I was storing on it over to one of my file servers before it died - most of them are replaceable, some not so much. The Mount Airy City Schools have had a problem with bomb threats over the last month or so, receiving 4 bomb threats in 5 weeks (one at the high school, three at the middle school), all after I made a post about what I felt was a real blunder of disaster planning at the near by community college I'm attending and the FBI visit I received a few days later. Well apparently the public postings paid off. After a couple rounds of echo the message (minus some of my colorful phrases) filtered up to the Superintendent of Mount Airy City Schools, who I've heard instantly caught onto the idea and that there's a good chance the the district will implement some form of distributed evacuation at the schools. This isn't saying anything about the college, but then again, they haven't proven themselves to be especially receptive to criticism. Apparently they really pissed off the county commissioners last night. I don't know the full story there, but I know it deals with questions the commissioners had about the school's "very positive" reports despite all of the student complaints about the administration and some of its policies. Part of it is that I'm homebrewing a blog engine, but even if I was moving to word-press I couldn't use the existing scripts. At least its fairly mindless, and I can eat my way though my podcast playlists while repeatedly hitting command C Tab Tab V Tab Tab. It's too easy to make fun of this image. Its amazing how ignorant people are when it comes to security. In a networking class today we had a teacher closed us off from the rest of the network and let us raise hell with hacking tools. Plain l33t hax0r script kiddie junk but a practical introduction to security, and more importantly, how its really hard to know when you're being attacked. So we're running our packet sniffing and password detection tools making one very hostile environment and nearly everyone is silly enough to log into some significant personal account. Several emails, a few personal web spaces, one fool even logged into paypal (which begs its own questions), I'm not sure what was more concerning - logging into priority accounts in a known hostile environment, or the week passwords. Makes me glad I use a lot of heavy passwords (the default brute force settings wouldn't have cracked my passwords).